Parents, Carers and Toddlers meet on Thursday mornings from 10am. Hall Royd Band is a long established Brass Band, which welcomes beginners and players of all abilities. Regular practices for the main band are on Friday evening and for learners / improvers on Monday evening. Tuesday Church: A fellowship group meeting on Tuesday mornings at 10.30 for prayer & worship. Midweek Concern is a prayer group that meets on Thursday mornings at 10 o’clock. Guides meet on Tuesday evenings. A vibrant group for girls from 10 years is complemented by a Senior Section from 14. A lively Brownies group for girls from 7-10 is run by fully trained leaders. This inclusive company welcomes girls of all abilities. 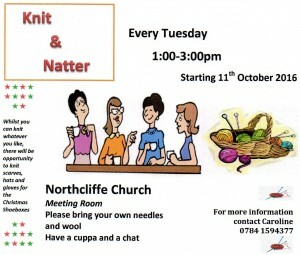 Knit and Natter Group get together on Tuesday Afternoons from 1pm. Whether you are an experienced knitter, want to learn or simply fancy a natter and a cuppa, come along. This social club for adults with learning disability meets every 2 weeks for a range of activities including disco, Karaoke, table tennis, bingo and more. There are annual day trips and a members’ committee. Conversation Class is a friendly group for ladies wishing to improve their English language skills. Whether it is speaking more confidently or fluently or learning to read and write basic English. Practical topics are covered and time is kept for the group to share news and information. Suitable for any ability. Everyone is there to learn and to help each other. The group meets on Friday mornings in the Community Hall from 9.15am. Our inclusive “All, Together” service is for people of All ages and All abilities, their families, carers and friends and anyone who wishes to worship and enjoy activities with and alongside us. Once a month, a collaboration with the Anchorage – with music to entertain, a pause for thought, occasional games or activities and speakers to share memories or hear ideas. Some opportunities for inter-generational contact as youngsters from Shipley Primary School come along to meet older people.